Now you can organize your precious recipe collection and locate what you are looking for in a flash. Do you often find yourself searching through kitchen drawers crammed full of torn-out or photocopied favourite recipes? Do you worry that you will lose or misplace precious handwritten recipes passed on by friends and family members? Do you all too often forget where you put that web address of the fantastic organic meat supplier or on-line gourmet deli you meant to try? 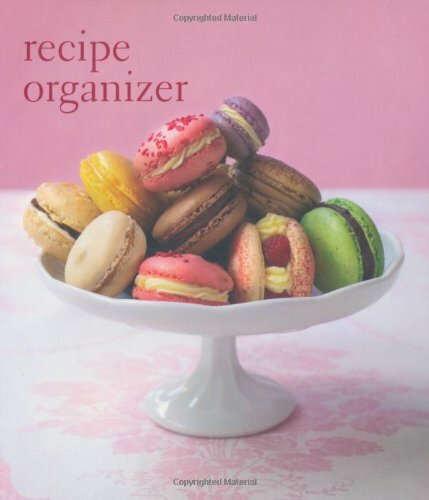 The Recipe Organizer will assist you with filing and storing your precious collected recipes plus allow you to keep all of your food-related notes and contacts in one safe and convenient place. As well as providing ample space for writing, it also includes six handy pockets for storing tearsheets plus an elastic pen holder. Ryland Peters & Small and CICO Books produce outstandingly beautiful books on homes & gardens, crafts, food & drink, health & well-being, weddings, and mother & baby, plus a vibrant gift and stationery list. We aim to capture, in words and pictures, those elements of life that give the greatest pleasure - sharing the perfect meal with friends, relaxing in a beautifully scented bath after a busy day, a home that makes you happy every time you open the front door. We look forward to sharing these pleasures with you during the next eleven years.